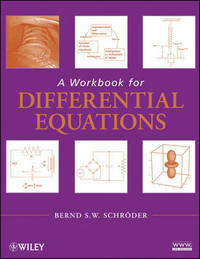 An accessible and hands-on approach to modeling and predicting real-world phenomena using differential equations A Workbook for Differential Equations presents an interactive introduction to fundamental solution methods for ordinary differential equations. The author emphasizes the importance of manually working through computations and models, rather than simply reading or memorizing formulas. Utilizing real-world applications from spring-mass systems and circuits to vibrating strings and an overview of the hydrogen atom, the book connects modern research with the presented topics, including first order equations, constant coefficient equations, Laplace transforms, partial differential equations, series solutions, systems, and numerical methods. The result is a unique guide to understanding the significance of differential equations in mathematics, science, and engineering. The workbook contains modules that involve readers in as many ways as possible, and each module begins with "Prerequisites" and "Learning Objectives" sections that outline both the skills needed to understand the presented material and what new skills will be obtained by the conclusion of the module. Detailed applications are intertwined in the discussion, motivating the investigation of new classes of differential equations and their accompanying techniques. Introductory modeling sections discuss applications and why certain known solution techniques may not be enough to successfully analyze certain situations. Almost every module concludes with a section that contains various projects, ranging from programming tasks to theoretical investigations. The book is specifically designed to promote the development of effective mathematical reading habits such as double-checking results and filling in omitted steps in a computation. Rather than provide lengthy explanations of what readers should do, good habits are demonstrated in short sections, and a wide range of exercises provide the opportunity to test reader comprehension of the concepts and techniques. Rich illustrations, highlighted notes, and boxed comments offer illuminating explanations of the computations. The material is not specific to any one particular software package, and as a result, necessary algorithms can be implemented in various programs, including Mathematica (R), Maple, and Mathcad (R). The book's related Web site features supplemental slides as well as videos that discuss additional topics such as homogeneous first order equations, the general solution of separable differential equations, and the derivation of the differential equations for a multi-loop circuit. In addition, twenty activities are included at the back of the book, allowing for further practice of discussed topics whether in the classroom or for self-study. With its numerous pedagogical features that consistently engage readers, A Workbook for Differential Equations is an excellent book for introductory courses in differential equations and applied mathematics at the undergraduate level. It is also a suitable reference for professionals in all areas of science, physics, and engineering. Bernd S. W. Schroeder, PhD, is Edmundson/Crump Professor and Academic Director in the Program of Mathematics and Statistics at Louisiana Tech University. Dr. Schroeder has authored more than thirty journal articles in his areas of research interest, which include ordered sets, probability theory, graph theory, harmonic analysis, computer science, and education. He is the author of Mathematical Analysis: A Concise Introduction, also published by Wiley.